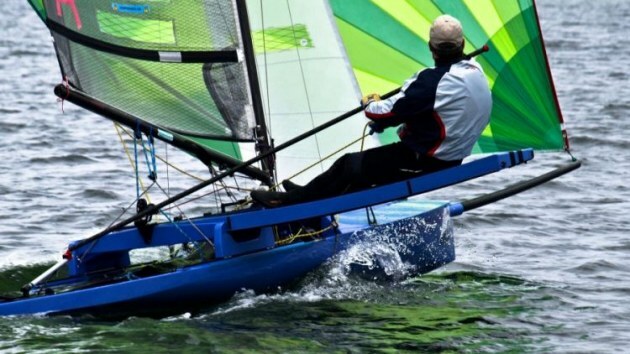 International Canoe Europa Cup 2018, Deutsch-Britischer Yacht Club, Berlin, Deutschland. With the European heatwave in full force competitors were pleased to awake to see a much stronger breeze than the forecast had suggested. As boats launched for the 1PM start it was good to see sailors reaching out towards the end of their sliding seats. With a north westerly wind, the race officer elected to set the start line near the beaches at Steglitz-Zehlendorf and the windward mark near the shores of Kladow. 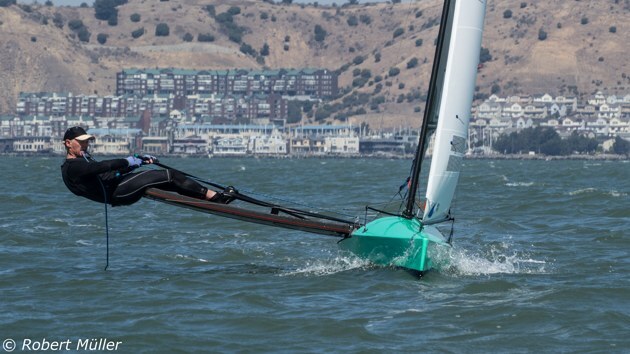 In the first race, the British team showed some dominance and shared the lead between themselves as Chris Hampe took the pin end start and gained an early lead on the left-hand shore. Shaun Anderson then took over the lead only to make a mistake on the final beat to let current world champion Robin Wood steal the win. 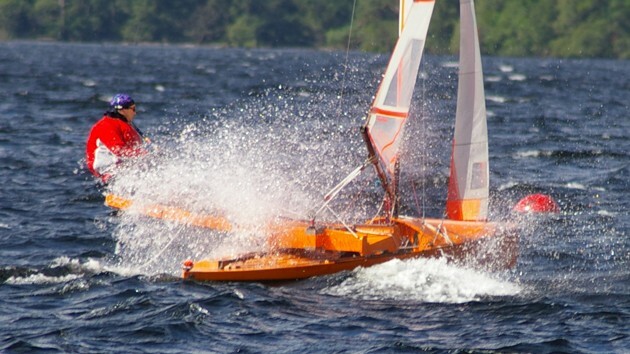 Axel Bierwagen finished 4th as the best placed German sailor whilst another Brit, Alisdair Alston came from behind to lead the One-Design fleet. The start of race 2 saw several strong gusts descending down through the course, these came together with large holes and bigger shifts making difficult conditions and catching a few sailors out with some capsizes. Robin Wood was the best at mastering the tricky conditions and soon opened out a safe lead on the chasing pack. Shaun Anderson again finished in 2nd and it was Simon Beers who rounded out the podium. Alisdair Alston had a more comfortable race win in the one design fleet. Race 3 provided some of the closest racing with the fleet holding starboard tack away from the line, holding your lane was essential. Robin Wood was able to edge his nose out in front where he would once again stay for the remainder of the race. The Germans were starting to find some form with Axel Bierwagen, Simon Beers, and Roger Regitz all challenging with Chris Hampe and Shaun Anderson. Axel would take the 2nd place ahead clear of Shaun Anderson who led a tight pack from Chris Hampe, Simon Beers, and Roger Regitz. With the morning bringing a flat calm across the river Havel in front of the Deutsch Britishcher Yacht Club the discussion at breakfast was whether there would be any racing held at all. The race official set an initial 2-hour postponement and with no changes in conditions, this was extended first by another two hours and finally by an additional hour. At 3 PM there was some trace of a breeze from the northeast so the fleet was sent afloat with the aim of getting a race start at 4 PM, With limited time the race officer set a windward leeward course. The first race became a drag race to the left-hand side with boats simultaneously tacking as the header came in suddenly as the boats approached the Kladow shoreline. At the windward mark, it was Robin Wood who had a narrow lead over Axel Bierwagen with Christopher Ossenkopp leading the ICOD fleet and mixing it with the newer boats of Robbert Stebbing and Simon Beers. Down the run finding the lanes of pressure was essential. Robin Wood pulled clear ahead and Chris Hampe managed to pass Axel at the bottom gate with the chasing pack led by Shaun Anderson closing in with the fresher breeze coming down the course. The first tack after the rounding proved disastrous for Axel, whose main halyard failed. He would be able to make an effective repair on the water but fell a lap behind. The three Brits, Robin Wood, Chris Hampe and Shaun Anderson would now be unchallenged for the podium positions. Race 2 started shortly after 6 PM and featured a bit of a pile-up on the line. Robin Wood was able to escape and soon had a large lead over Chris Hampe who was pulling ahead of the chasing pack. 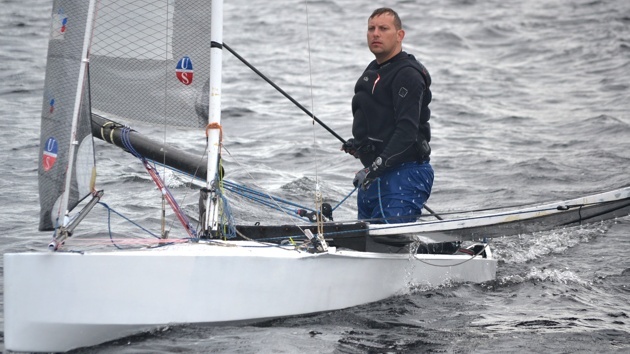 Christopher Ossenkopp mastered the conditions in his ICOD to be third at the windward mark: a position he was able to maintain to the finish as the breeze started to fade. With a light final run, Chris Hampe was rapidly closing up on Robin Wood to set up a spectacular finish to the days racing. 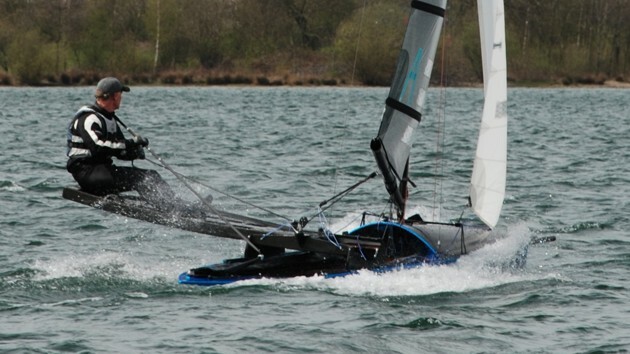 As the pair reached the downwind gate the gap had closed right up from around 200 meters. Robin took the port rounding to head toward the eastern shoreline and Chris who rounded just seconds later opted to split away around the other mark. At the first cross, Chris was ahead and covered tacked perfectly to cover the left-hand side. The next cross was in sight of the finish and a bad tack from Hampe allowed Robin to get slightly bow forward as the two boats locked horns, both in sight of the finish. With one further tack from each boat, Robin now had the advantage and secured his fifth race win of the series. After a lay day in Berlin, the fleet awoke to a light breeze from the northeast and the race officer announced his plans to run two races in the morning with an additional two races to be sailed in the afternoon. In the first race, Chris Hampe and Robin Wood started towards the pin and headed for the shift on the left. The wind though had other plans with a big right-hand shift and it was Robbert Stebbing who led a large group of boats at the windward mark. Robin Wood would eventually sail through the front markers to keep his run of 1st places while Jan Stahl would record his best result of the championship in second with Stebbing third. Race 2 was sailed in slightly lighter air and it was essential for the sailors to keep looking upwind to find the patches of wind as they tracked down the course. The race was led from the start by Robin Wood ahead of Shaun Anderson and Roger Regitz in third. In the ICOD fleet, Christopher Ossenkopp continued his dominance. 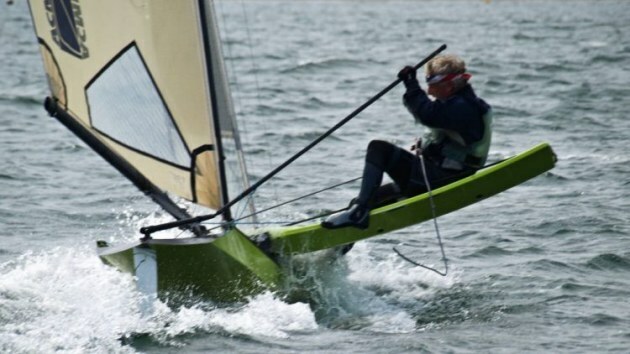 After a short break ashore for lunch, the sailors returned to the course area to find that the wind had filled in with the sailors making full use of their sliding seats. The British trio of Robin Wood, Shaun Anderson, and Chris Hampe all started towards the pin and while it was Hampe who was first to tack towards the right, It was Robin Wood who led around the windward mark. The three Brits would hold onto the leading positions throughout the remainder of the race. In the final race, Robin Wood was OCS, leaving the way clear for Shaun Anderson to take the win from Chris Hampe. Chris once again had to sail a recovery race after being a long way back in the pack at the first windward mark. Simon Beers was third just ahead of Axel Bierwagen who continues to be the best placed German sailor in the overall standings. With three more races scheduled for the final day, it looks likely that the Brits will fill the podium. The final three races of the 2018 IC Europa Cup had a grandstand finish with the races held directly in front of the Deutsch-Britischer Yacht Club. The race management team completed the full schedule of 12 races in somewhat difficult conditions. For the series, there was only one discard so everything was still to play for despite the dominance of the leading British trio who were occupying the podium. Race 1 started shortly after 11 AM and the boats were soon fighting for positions along the western shore of the Havel. The crosses were close and there were many tacks and position changes except for Robin Wood who led all the way around from Axel Bierwagen and Chris Hampe. Race 2 was once again back to the British dominance with Robin Wood, Chris Hampe and Shaun Anderson able to pull well clear of their German competitors. The race was quite fierce between Shaun Anderson and Chris Hampe who engaged in a match race fighting for 2nd place in the overall standings. Hampe would just pull clear ahead at the windward mark after keeping to the western shore whilst Anderson was forced to give way to a barge in the shipping channel. Going into the final race Robin Wood just needed to finish to secure the championship whilst Chris Hampe and Shaun Anderson were now tied on points in the race to be second. In this final race, the wind was occasionally veering to the east with significant changes in pressure. The start line was heavily biased towards the pin end and Chris Hampe timed his approach with perfection to lead a group of boats towards the shore. 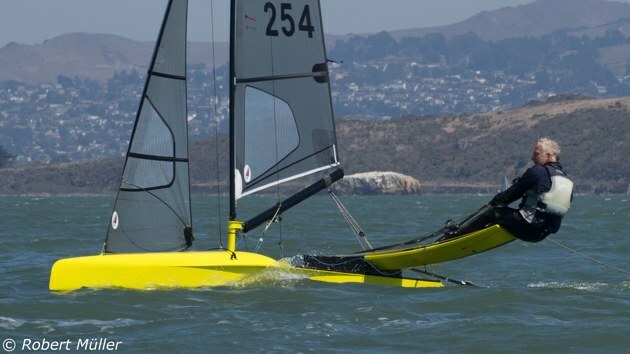 With the changing wind, the boats who tacked away early had the advantage as the pressure had filled in on the center of the course Robin Wood led Shaun Anderson at the windward mark. On the run, the wind died allowing the lead boats to pull away into a significant lead. There was then an uncharacteristic error from Robin Wood as he headed upwind mistaking one of the channel marker buoys for the windward mark. This allowed Shaun Anderson to come through for the win and secure the second-place spot. Axel Bierwagen also slipped past Robin to ensure fourth place and secure the German national championship. There's a photo collection at this site. Look for news on Facebook here on the International IC section and here on the German IC/Taifun group. Anywhere else you come across please let me know. I hope Robert Muller will be treating us to his excellent camera work.